¡Hola! A couple of weeks ago, I started posting pictures from my December 2010 trip to Costa Rica (it really doesn’t seem a year ago, but I’ve travelled so much since then). Believe it or not, it truly has taken me this long to upload all of my photos. I take a lot of pics. A. Lot. And it’s tons of work viewing, sorting, cropping and tweaking them all. So when I finally uploaded the pics, I immediately posted some of a night tour I did my last night in Bahìa Drake. Partly because the nocturnal creatures fascinated me, and partly because I thought the red-eyed tree frog pics were stunning. To complement those posts, I’m doing a series about that trip. 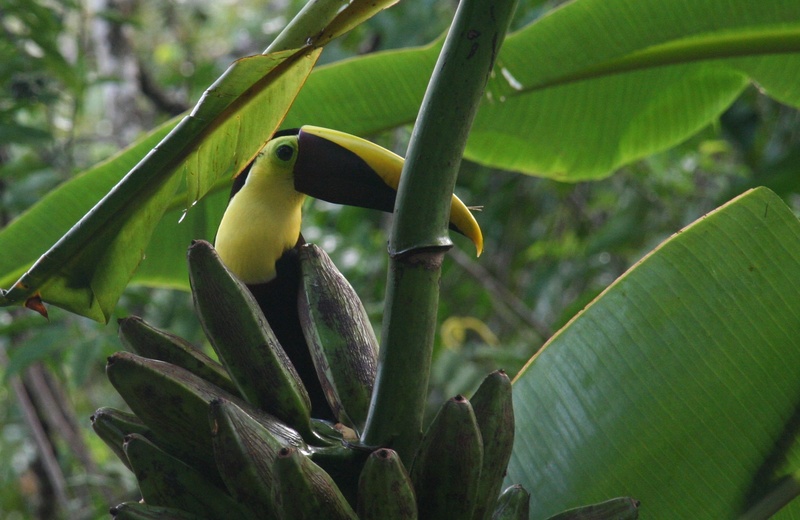 I started in Bahìa Drake, which was full of wonderful sights and sounds, from stingrays and crocodiles to howler monkeys and toucans (that’s a toucan above – in a banana tree at my resort!). I’d like to capture the fun and adventure as well as the calm and solitude of that week on the Península de Osa, so each day there will merit its own post. As I moved north to the more touristed areas of the country, the activities became more about the activities, so I might take a different approach when I get there. So let’s see where this journey takes us! Beautiful…Costa Rica has been on my mind lately, and saw your image while I was reading through ‘photography’ blog topics. Nice capture!